This post is a little different to many others on the blog so far, reflecting on the team’s activity as part of SussexSport’s Commit to Get Far challenge 2017. The challenge was set for teams to track their activity to “virtually” travel the distance from Land’s End to John O’Groats – a total of 900 miles! The challenge started on the 18th January 2017 but teams were welcome to continue tracking their distances for as long as they wanted….. and team ADQE wanted to continue! The first part of the challenge was actively supported by SussexSport, with a wall map and postcards sent when we reached waypoints along the route. The ADQE Commit to Get Far webpage was born – showing a map of our progress, and funky charts to show the team’s activity! The form then feeds into the charts displayed on the Google Site, which are updated a couple of minutes after the form is submitted. The team relished the activity challenge – logging hundreds of miles within the first couple of weeks! The site helped to keep people updated with the team’s progress and gave a strong push to log more activity. The team managed to complete Part 1 of the challenge – 900 miles – on 15th February 2017. Charts showing the number of miles completed, and miles remaining in the challenge. After reaching John O’Groats, the team had a decision to make – should we continue on our journey? The response was an overwhelming “yes” and we quickly decided to venture across the North Sea to Oslo! We selected a few funny waypoints along the way – some in the North Sea were labelled Sea Serpents’ Lair and Neptune’s Hangout to keep us entertained! This gave the team a further 750 miles to travel across both sea and land. We raced through the second part in 4 weeks, finishing up in Oslo on 13th March 2017. The team obviously enjoyed the Scandinavian air, as we opted to travel through Norway, Sweden and Finland before ending up in St. Petersburg. This was the third part of our journey, and the team had clocked up over 1,600 miles by this point, so I thought things may calm down. Obviously not, as the team whizzed through our waypoints along the way – including Gothenburg, Stockholm, Tornio and Helsinki. We managed to reach Russia on 25th April 2017 – 97 days into the challenge. By this point, the team had notched up over 3,000 miles, and the Commit to Get Fit challenge was about to start. Surely the appetite to keep trekking across the continent had faded by this point!?! The team wanted more, more, more – though maybe venturing to warmer climates. We decided to head South through Europe, passing all the capital cities on the way down. 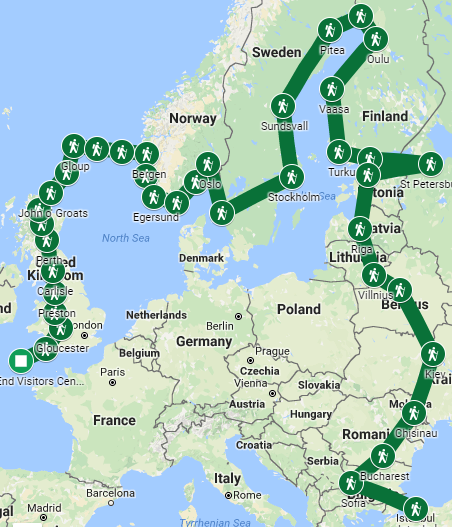 We completed a further 1,500 miles of travelling through Estonia, Latvia, Lithuania, Belarus, Ukraine, Moldova, Romania, Bulgaria and finally Turkey. This took another couple of months, but we made it all the way to Istanbul on 26 June 2017! The next steps are still being discussed, we may carry on westwards through Europe to make our way back home. Alternatively, we might head south to Tabletop Mountain – only 8,000 km away – and virtually “visit” most of Africa on the way! Total days so far: 163 days.